Impossible Realities Gaming and Cosplay Convention located in Saint John NB was one of the first places I discovered modern tabletop gaming. 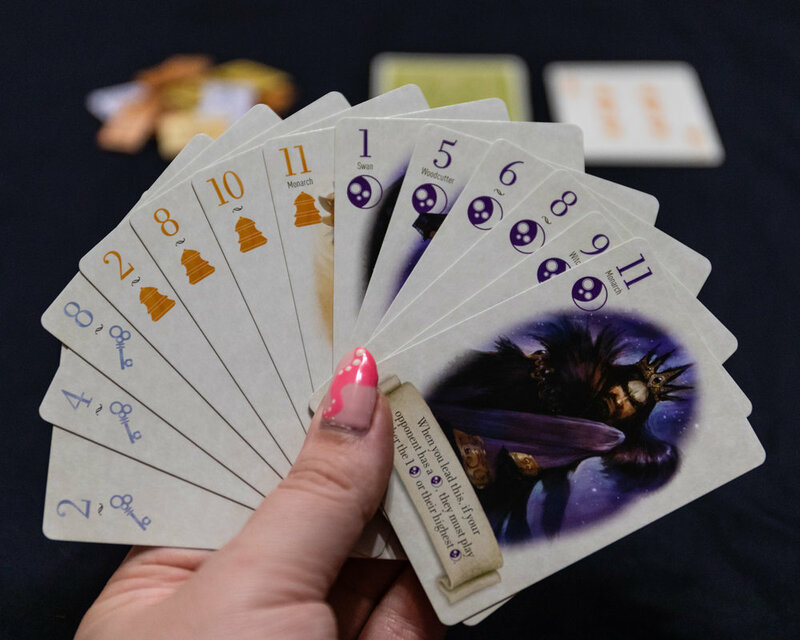 One of my favorite featured activities at IR is the Play to Win, a collection of games you can play and by doing so are entered in a draw to win the game. This year I decided I really wanted to contribute to the Play to Win but struggled to choose which game I should contribute. I thought long and hard on this and finally came to a conclusion based specifically on player count. 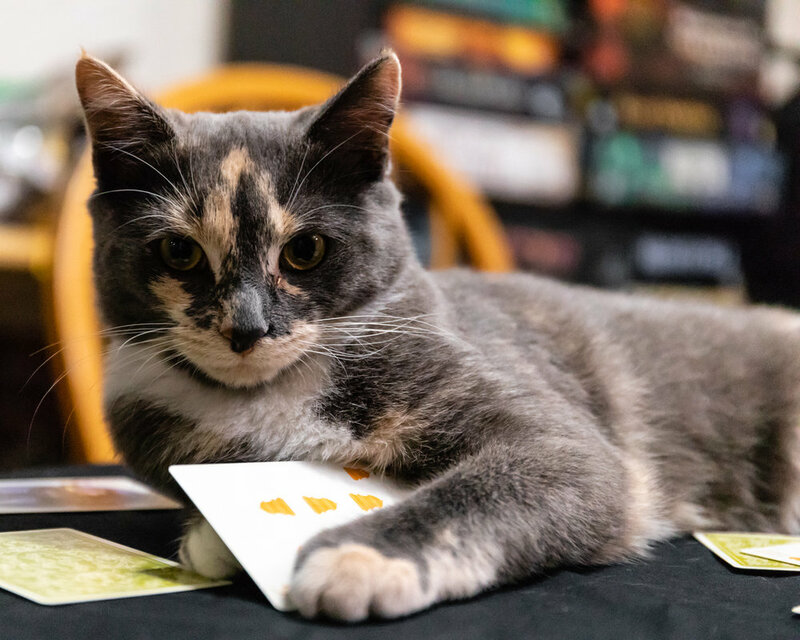 One common struggle when you start enjoying board games is player count and what to play if you only have a second player. After consulting the internet I thought The Fox in the Forest could be the perfect solution. 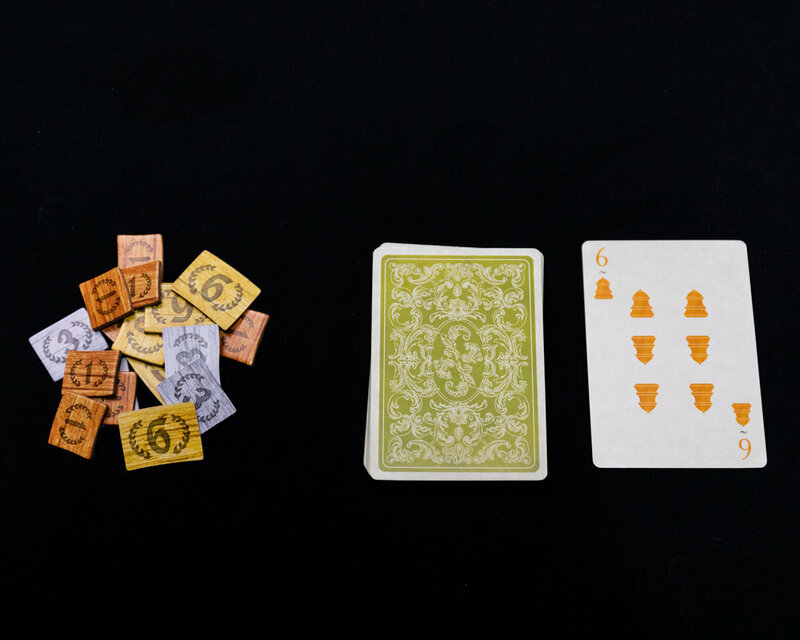 Shuffle the deck and deal 13 cards to each player. The remaining 7 cards will form the draw deck. Turn the top card of the draw deck face up and place it next to the deck. This card will be the decree card for the round. After each round, alternate the dealer. The non-dealer will lead the first Trick of the round. The leader can play any card from their hand. The suit of that card becomes the lead suit for the trick. After the lead card is played the other player must now play a card. They must play a card matching the lead suit if they can. If they do not have a card in the lead suit they may play any card they like. If neither suit matches the suit of the decree card, the player who played the highest card in the lead suit wins. 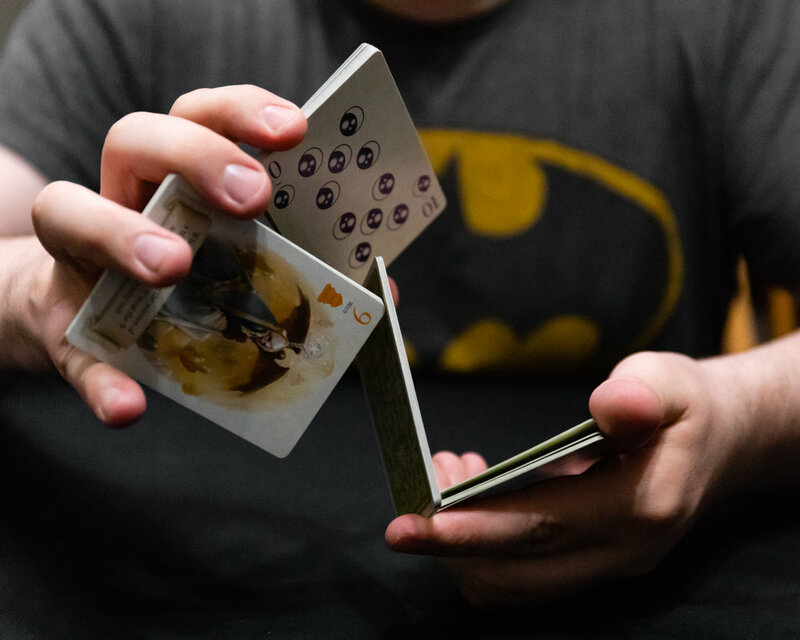 If either card matches the suit of the decree card, the player who played the highest card of the suit matching the decree card wins. The winner of the Trick takes the two cards and keeps them face down on their side of the table. The winner of the Trick leads the next Trick. 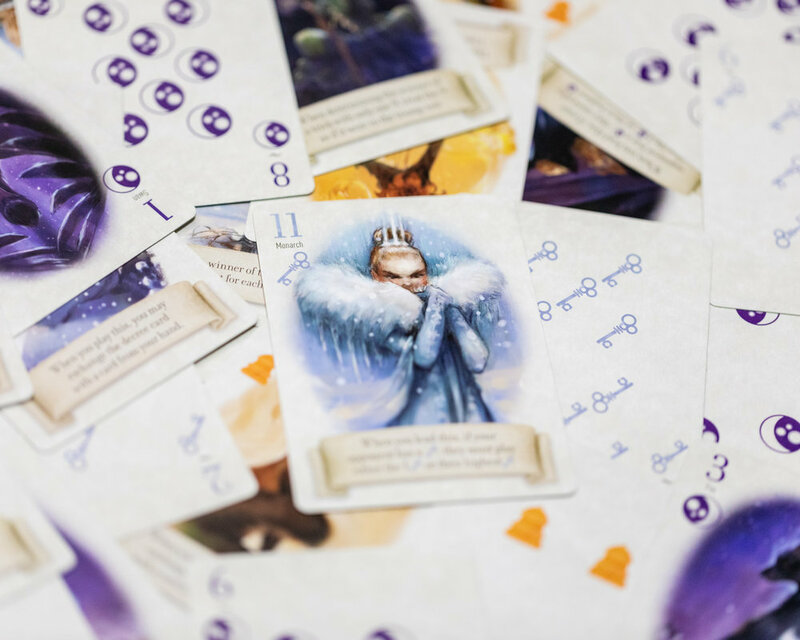 All the cards of odd rank have special abilities that modify the game rules. After all 13 tricks have been played the round is over. Points are scored based on the number of tricks you have won. After scoring, if either player had at least 21 points the player with the most points wins. The components are good quality. The box is only as big as it needs to be with just enough room for the cards and tokens. I definitely prefer this over a small deck box as those tend to get damaged over a short period of time. Instead of a score pad the game comes with point tokens. Genius planning in my opinion. The only downside is that there is not enough point tokens to keep score if you use the modified rules for a longer game. Personally, I would never do that anyways. I think it plays perfectly at the 21 point end game. I've played other trick taking games before. Some of them are outstanding while some lack the little bit of extra fun that makes the game enjoyable. 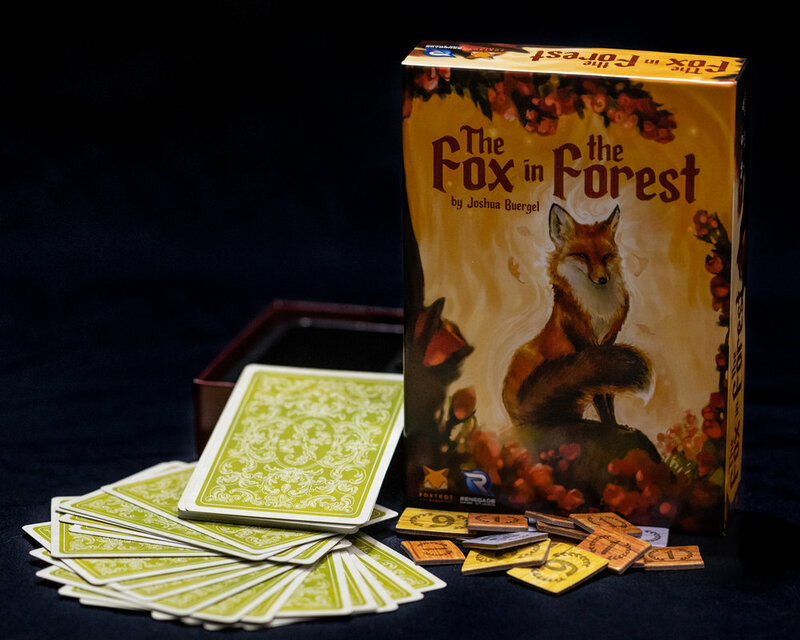 The Fox in the Forest adds a unique twist by giving some cards special abilities. The abilities aren't random at all. Because of the special abilities there is no such thing as a bad hand. The cards are extremely well balanced and when executed properly can even come as a surprise to your oponent. Some of these cards are "may" abilities which means you won't get stuck with doing something you don't want to. If one twist wasn't enough to sell me on the game, a second one was. 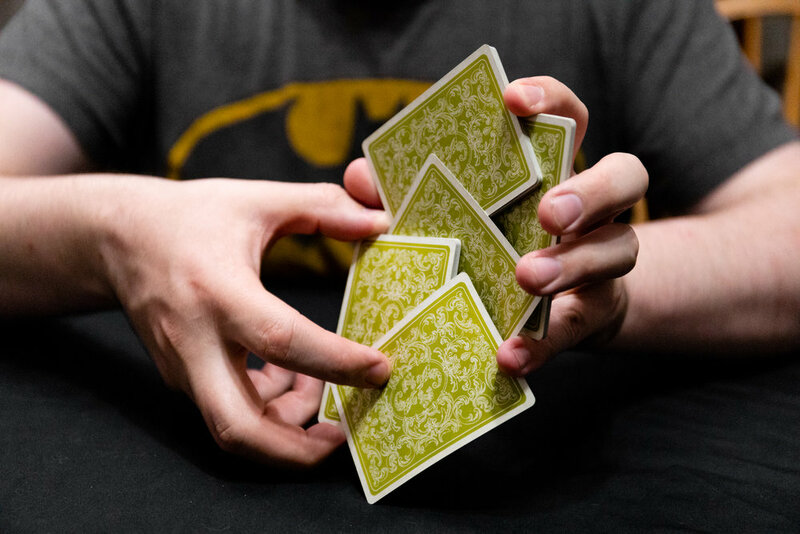 Intead of being able to accumulate infinite points for winning every hand you have to carefully plan the number of tricks your are going to win. Optimal points fall in the 0-3 and 7-9 brackets. Scoring too many tricks will actually punish you which makes the game a tad more friendly. You can still try to control which of the brackets your opponent ends up in forcing them to score as little as 1 point which will require more careful planning on your part. This game is a must have for anyone that struggles to find 3 or more players. It is very calculated and perfected by it's designers. It doesn't take long to play and would be ideal for a filler, warm up or travel game but I wouldn't limit it to that. The game can be as little or as high strategy as you like which makes it great for all ages and experience levels. This game is part of Impossible Realities Gaming and Cosplay Convention's Play to Win Library in Saint John NB September 7-9 2018. Stop by and play for your chance to take it home. If you get to play leave a comment below letting me know your thoughts and what games you would like to see next year.